RAILROAD.NET • View topic - Griegsville and Pearl Creek Railroad. Griegsville and Pearl Creek Railroad. RussNelson wrote: Speaking of Rochester, does anybody know anything about the Griegsville and Pearl Creek Railroad? It's on this map, and it's in the Railroad History Database, but I can't find anything else about it. I think it may have been a paper railroad that somehow gained more existance than it deserved. Greigsville is where where the DL&W interchanged with the Genesee & Wyoming, north of Mount Morris. This railroad, if it existed, would have run between Greigsville & Pearl Creek, over a ridge near Paines Corner. A total distance of about 8 miles. Greigsville is on the DL&W and the G&W. Pearl Creek is on the BR&P south of Leroy. So a railroad connecting the two towns, and the three railroads, (BR&P, DL&W and G&W) might make sense in theory..
it doesnt really make sense, since all three railroads already interchange around Caledonia and Leroy...so a line between Greigsville and Pearl Creek doesnt make a lot of sense afterall. The "connection" the railroad would make would serve no purpose that isnt already served a few miles away. If this railroad did exist, it probably ran along Pearl Creek (the actual creek) from the town of Pearl creek, then East through Paines Corner (over the ridge) then either along the creek/Old state Road to Tryons Corners, then to Greigsville. or overland to Peoria, then Greigsville. Old ROW's are clearly visable..the abandoned DL&W can be very clearly seen. There is very little that looks like a ROW between Greigsville and Pearl Creek..although the ideal route for a railroad, if it did exist, is today roads and highways for much of the plausable route..so its possible roads were built over much of the ROW..which would explain why no railroad ROW is visable today..
although I think its likely most of these roads already existed by 1898. I found two artifacts that could possibly be a ROW, and they are in the right place. IMO an old ROW, especially from the early 20th century, would be a lot more visable.. The charter date for the G&PC, according to the WIKI, is 1/26/1898. All the other area railroads already existed by that point. IMO, this railroad was never built..I think it was a paper-railroad only. im not seeing any hard evidence.. I may be chasing shadows, but as you can see, it is in the same location as your first line, but offset a few degrees. My opinion - the line may have been started, may have been completed, but never made money, and was only open for a period of months or 1-2 years before the towns realized it was never going to work. The predecessor to the BR&P was operating through the Warsaw valley by the early 1870’s. The DL&W commenced operations through Greigsville about 1882. And the G&W was operating at the turn of the century. So all (3) potential interchanging railroads were indeed in existence long before the “G&PCRR” was ever organized. Seems odd however that the G&PCRR was ever even considered. As you observe the DL&W already had an interchange junction with the BR&P just north of Pavilion Center – only 5 or 6 miles distant from the proposed DL&W interchange a Pearl Creek. And the BR&P and G&W interchanged at P&L Jct in Caledonia – less than 10 miles north of Greigsville. Finally your artifact at the Greigsville end of the G&PCRR would have resulted in a fairly steep grade. Inspecting a topo of the area it looks like roughly a 140’ rise over bit more than ½ a mile (= nearly a 5% grade). Would have made it kinda tough getting any kind of westbound tonnage up that hill! So I gotta think you are correct – the G&PCRR only ever existed on paper. Could be however a bit of grading was done simply to encourage (or dupe…) potential investors. Will be interesting to learn if others have more information on this line. Not every line is proposed to serve as a bridge line. In this case the G&PC was proposed to connect two towns with the intention of salt mines being built all along it. It was the salt along the line that created the need rather than creating new interchange points. So this case it was not railroad fever but salt fever. Every town thought they could have a salt mine. So build a RR to haul the salt and connect on both ends to other railroads so you're not locked into one connection and their rates. The has been much published on the salt industry in WNY. There were a ton of mines, most of which are now gone but many more that were proposed and never opened (lack of money or lack of salt after drilling). With mines in Silver Springs, Rock Glen, Warsaw, LeRoy, Mt. Morris, Cuylerville (2), York, Retsof, Wadsworth, etc., everyone thought they could just drill and salt would be found. All sprung up during that 1880-1900 time period and most closed by the early 1900s. Of course some lasted longer: while one in Cuylerville lasted until around 1900, the Sterling mine lasted until 1929. The mine itself was merged in with the Retsof mining. Most people don't realize that Warsaw still has active salt "mining". Up on the hill for the Erie brine is pumped from the ground and carried via pipeline to (I think) Buffalo. It's basically an automated operation. In regards to the red line at Spragues Corners, that was the original configuration of the road. The road coming from the SE in the map extended across Silver Lake Rd and hit Rt 19. Rt 19 has been drastically reconfigured in that area. And to clarify, the line was only proposed and never built or graded. It was solely on paper. 20 years researching in every library in Livingston County as well as a good portion of Wyoming, Allegany, and Monroe. The County Clerk's offices in all those counties. The Local History Room at SUNY Geneseo. 100s of manhours of researching deeds in all those counties. The salt stuff is easy to find. Go to any good size library, head to the local history section and look for the NY State Museum series on natural resources in NY. The photos, maps, and RR info alone are worth it. Okay, so since it seems to be a paper railroad, I'll go delete it from Wikipedia. Unless somebody wants to start a "Paper Railroad" section (which would be, I guess, akin to those fantasy football leagues), there's no point in keeping it around. I wouldn't delete it, just note that it didn't exist, though Charles' post is an excellent example of what was happening there at the time. Rather than delete it, then, perhaps over time, someone can add more about it, and if it was graded, and whether it actually had a sound business plan that otherwise failed. The Panama Traction Company in Chautauqua County existed on paper, bought rail, and even graded a section of the line, but then the owner lost his shirt after World War I, and it collapsed. He was the owner, at the time, of the geological formation known as Panama Rocks, and he had a built in attraction there. He just couldn't quite get it together. People were hired to begin laying rail...and then promptly laid off. The ROW is still visible in a few places even today, and the railroad, such as it was, died in 1918 or so. It may even exist on a few property maps, and it did until a few years ago for sure. I'd argue that it's just another interesting part of history. My call would be to leave it. Oh ho! Can I find out more about this railroad? 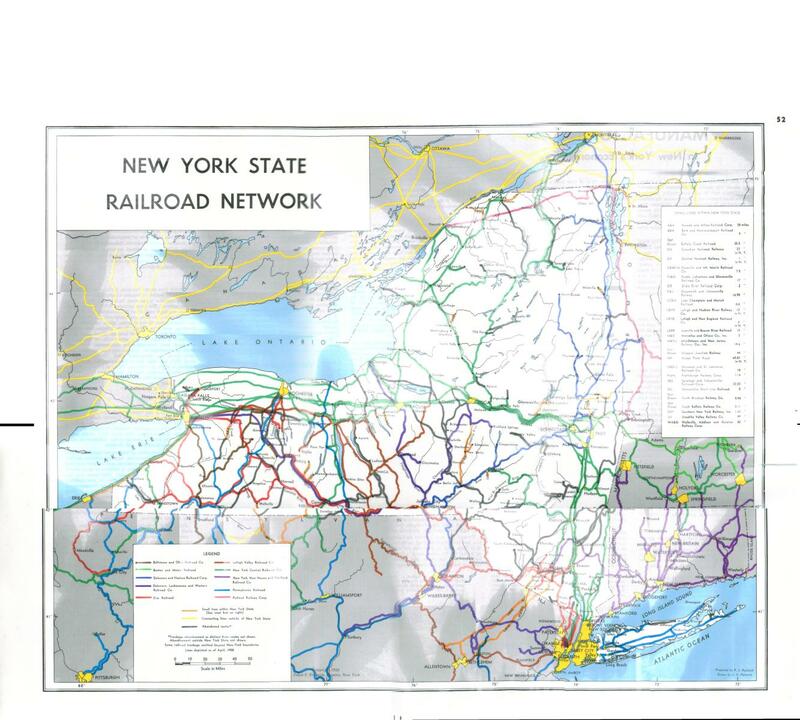 I'd like to add it to http://russnelson.com/nyrr/ because I decided to add graded railroads even if they never saw rails. Russ...PM me if you'd like. Honestly, it's very hard to find some information, but I am lucky to work in the namesake school district, which is how i got more information. I have been told there is a pile of old raisl in the woods, but when I looked, I had nada. What little I have gleaned came from skimming the ledgers of Willis Eddy, who was the man that owned the Rocks for a bit. His ledgers exist...barely saved from a fire that wiped out more history that you'd care to hear about. I don't even know how much was lost, and it was more than ten years ago, I think. The ledgers are fascinating skimming, but no substantial text exists. RussNelson wrote: Oh ho! Can I find out more about this railroad? I'd like to add it to http://russnelson.com/nyrr/ because I decided to add graded railroads even if they never saw rails. I think this thread tells you everything there is to tell! This railroad was not even graded..paper railroad only. Thanks Charles for the info..
salt mines! interesting..I wouldnt have thought of that.. If you were to go railfanning back in the 1895 era in the Genesee Valley down near Retsof, you could have seen so many trains hauling so many cars of salt it dwarfs the strings of salt we remember on the G&W. That's just in a small section of the valley. Jump over some valleys in you still have salt mines along the Erie & BR&P between Silver Springs and Warsaw and further north along the BR&P. Most closed down but in the case of the mines around Retsof, later mining through the 20th century incorporated the salt deposits that the prior mines had been collecting. Most of the mines listed actually drove pipe in the ground and pumped water down. The water came back up as brine and the water was evaporated off in huge copper pans (Grainer Process). Salt was bagged and from most of the photos I've collected, shipped in boxcars. This would have been a finer grade salt used for the table or farming, not rock salt. Sterling was a real mine as was Retsof. Atofina in Piffard on Rt 63 covers one salt mine. Houses cover another in Cuylerville. Sterling is an empty field and Rod & Gun Club in Cuylerville. If you're interested in such things you can find the York Salt mine and see the foundation ruins and pipes driven vertically into the ground. It's best to go in the Fall or Winter (with no snow). And it's been gone over 100 years! Do not treat paper railroads like fantasy sports, Russ. The roads were much more real than that. While some never made it off the charter page, some did indeed build something...grades to full track segments...and even purchased real equipment. Some were folded into other operations before they themselves began operating, some were charted just for building purposes and often by large existing roads, others just disappeared. So it can be said that some "paper roads" were very real and exist today as part of a larger road. Graded, some track, eqiupment delivered, never turned a wheel: Pittsburgh, Binghamton and Eastern from Troy, PA to Monroeton. Chartered, built under the name chartered, turned over to "parent": New York, Lackawanna and Western from Johnson City, NY to Buffalo as construction company for Delaware, Lackawanna, and Western. List is endless for all forms. As to Griegsville area. I have a highway map book put out by National Survey of Chester, VT circa 1915 that shows the jct of the DL&W at Griegsville with the Genesee and Wyoming. But just south of Griegsville is an unmarked rail line going east to the PRR Rochester Div and then north toward Retsof. Any ideas?